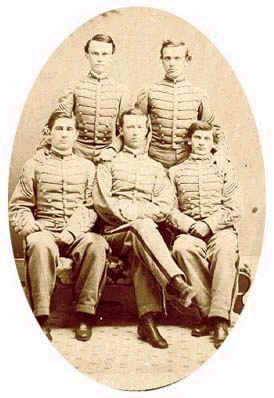 The Virginia Military Institute was founded in 1839, outside the town of Lexington, Virginia. The cadets and the Instructors were part of the Virginia militia system. Classes each year began in July with an encampment. The entire cadet corps was present for the encampment, where they would take part in marches, field exercises, infantry and artillery drills and guard duty. Cadets at the VMI were expected to perform well scholastically as well as physically. The physical training, or at least part of the training was moving field artillery pieces around the parade grounds. There were two of specially made lightweight canons manufactured for that purpose. The students named them Matthew and Mark. The corps was called out in 1861, to protect Virginia state property and again in 1862 to assume a defensive position in case of an invasion of the Shenandoah Valley. On May 15, 1863, the VMI corps of cadets assembled to pay tribute to, and to bury their former instructor Lt. General Thomas J. Stonewall Jackson. One year later the corps would assemble to take part in the battle for which it is most famous: New Market. New Market was a village in the rolling country between a fork of the Shenandoah River and one side of Massanutten Mountain. The battle took place between a Union force of about 6500 men, commanded by Major-General Franz Siegel and a Confederate force of less than 5000 men, commanded by Major-General John Breckinridge. General Breckinridge was ordered to deny General Sigel access to Staunton, Virginia. On May 15, 1864, a force of 215 to 258 Cadets arrived from Lexington to assist General Breckinridge in his defense of the Valley. The cadets were fifteen, sixteen and seventeen years old, though some accounts record cadets as young as twelve. The youngest cadets were left behind in Lexington, feeling disgraced at missing the opportunity to fight. General Breckinridge kept the cadets in reserve during the morning and the early part of the afternoon; he did this at the request of President Jefferson Davis. The President wanted to prevent what he referred to as grinding the seed corn of the nation. Later in the afternoon, General Breckinridge could wait no longer and told his adjutant Charles Semple, Put the boys in, after some hesitation, he added tearfully, and may God forgive me for that order. The cadets went into battle led by Lt. Col. Scott Shipp, age twenty-four. Insults were shouted at the boys as they approached the front lines. The veterans yelled: Here come the wagon dogs!, Katydids!, Ho, bombproofs, get outta them good clothes! and other disparaging remarks. The cadets wanted to stop and fight on the spot for their honor, but were ordered forward. They joined the Confederate line in the center, a place regarded as a great honor and moved with the line as it went up Bushongs Hill. On the way up the hill they passed their own artillery battery that was already in action and moved down the other side. Five cadets from C Company went down from shell fire almost right away. The other cadets had not believed the battle was so close. Sergeant Cabell called for the boys to close up and move forward. The cadets moved to within 300 yards of a Battery of the 30th New York Artillery, commanded by Capt. Albert von Kleisen. The boys took cover in a ravine filled with cedar scrub and stumps. It should be noted here that the ravine was filled with thick mud; the result of a week of heavy rain. The mud in the ravine was so thick that many of the cadets' shoes were left behind, stuck in the mud. This area is now known as the field of shoes. As the Confederate line moved forward the cadets moved with the veterans. The cadets made it through the ravine more swiftly than the 62nd Virginia Mounted Infantry, which was on their right. Their line was split at Bushong House, but was reformed in good order on the other side. After the cadets were reformed, Col. Shipp gave the order, fix bayonets. The Colonel and several cadets were struck by shell fragments and fell at this spot. Following the blast, many of the cadets seemed ready to falter, but Cadet Pizzini of B Company swore that he would shoot anyone that ran away. The boys pressed onward. Capt. Franklin E. Town of the United States Signal Corps watched the movements of the cadets and was so taken by the precision of their movements that he overlooked fact that he could have been captured. He observed that as the big guns changed from canister to double canister, the lines did not falter; it was as if the cadets were on parade. The cadets continued until they were inside the Federal lines, where they captured an artillery piece. The cadets cheered wildly as the VMI flag was waved over the captured canon. The cost of this battle for the VMI was 10 dead and 44 wounded. By comparison the 62nd Virginia had 7 of its 10 Captains shot down and 241 dead or wounded. After the battle General Breckinridge sent the cadets back to act as reserves. The following day General Breckinridge stopped to pay his compliments, he said, Boys, the work you did yesterday will make you famous. Like a true veteran, one of the boys told the General the fame would be all right, but they would be happy to find the Generals commissary wagon. Each year on May 15, the corps of cadets retraces the steps of the New Market battle and performs a special ceremony. The roll of the corps of cadets is called, but with ten additional names added to the roll; the names of the ten cadets that died at New Market. As each of these names is called, a living cadet steps forward and replies, Died, on the field of honor, sir. The Virginia Military Institute is still in operation today. It continues its tradition of providing a good military education to its cadets in addition to the excellent training in engineering and the sciences.